ARLINGTON, Texas (June 12, 2018) – Back by popular demand, ‘Enchant Christmas’ will once again illuminate North Texas skies with the World’s Largest Christmas Light Maze and Market. Last year, more than 250,000 people unwrapped a new holiday tradition at the most scenic wonderland in Texas. 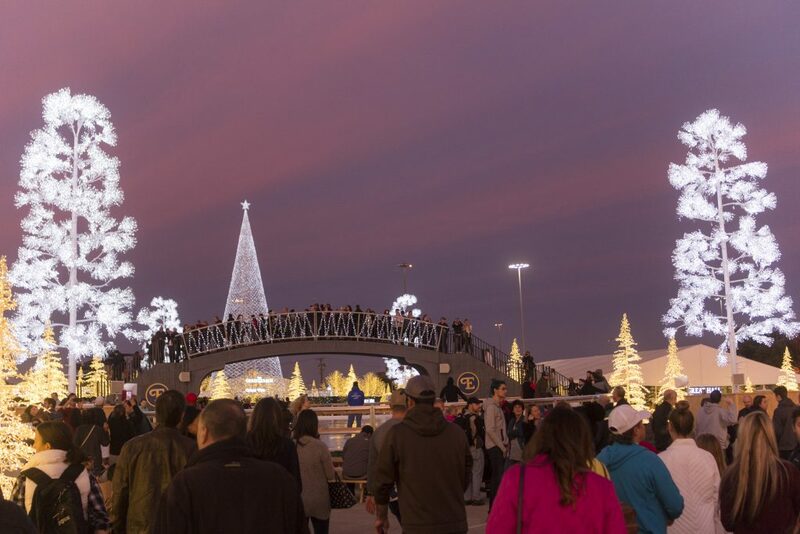 This year, the family tradition will move inside Arlington’s Globe Life Park, with a brand new adventure in the light maze, and a larger, dazzling Artisans’ Market. ● The World’s Largest Holiday Light Maze – A brand new maze and story: Eddie the Mischievous Elf has hidden eight toys that Santa needs to begin his Journey around the world. Will you come and help Santa search? ● All-New Skating Trail – Glide down our magical ice skating trail, which takes you through the brilliant light displays. An experience like no other in North Texas! Rent a pair of skates for instant family fun – or a romantic date! ● Santa and Mrs. Claus Appearances Nightly – No matter if you’re young or young-at-heart, visit with Santa and tell him your Christmas wishes. Then, enjoy a special story time as Mrs. Claus reads her favorite holiday stories. ● Eat & Drink – Relax and enjoy holiday-themed food and drinks that are sure to please everyone. ● Main Stage – Enjoy nightly live music and entertainment. In collaboration with the Texas Rangers, Enchant Christmas lights the Texas skies November 23 to December 30, 2018. Hours of operation to be announced soon. Enchant will take place inside Globe Life Park, 1000 Ballpark Way, Arlington, Texas 76011. Santa is delivering a limited number of early bird tickets with special pricing. Enchant Christmas is produced by Vancouver-based Shine Lighting Group, Inc., a professional Christmas light company serving Canada and the U.S. since 2010. Shine specializes in the design and implementation of tailor-made lighting experiences for public spaces. Their passion is crafting a visual experience that encourages interaction and creates a festive atmosphere for guests to enjoy. For more information, visit ShineMoreLight.com.